Tell D.H.S. Secretary Kirstjen Nielsen and Congress that separating children from the parents is cruel and inhumane! Recently, the New York Times reported that more than 700 children have been taken from parents arriving at our borders since October, including more than 100 children under the age of 4. It’s cruel to punish parents who are doing everything they can to protect their children and to punish children by depriving them of their parents. Separating a child from a mother or father only leads to more trauma for all. Losing a child is every parent’s worst nightmare. Join us in telling Members of Congress and D.H.S. Secretary Kirstjen Nielsen that we strongly oppose separating infants and children from their parents. 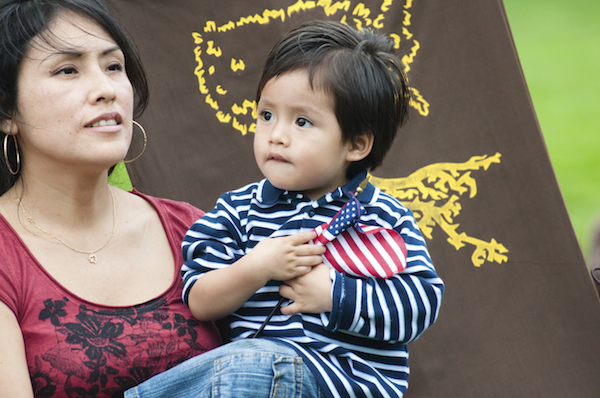 Join us in calling on Congress and Secretary Nielsen to keep families together! Recently, the New York Times reported that more than 700 children have been taken from parents arriving at our borders since October, including more than 100 children under the age of 4. Punishing asylum seekers by separating families is inhumane and beyond belief, yet it's the story of too many mothers and children who seek asylum on our shores. Separating families causes unnecessary trauma to children and families, overburdens our current government systems and causes immigrant children and families to live in fear. In addition to being cruel, separating families is also expensive. The government practice of detaining mothers and children apart from each other would cost taxpayers an average of $327 million per year. This spirit of welcome of immigrants is our nation’s strength. We believe that families should stick together, that we should look out for each other, and that hard work should be rewarded. Separating mothers from their children does not represent the values we teach our children -- or what we aspire to be as a nation. We call on Congress and Secretary Nielsen to protect basic human rights of women and children who deserve to be treated with compassion, dignity and respect by ending these harmful practices that harm our families, communities, economy and country.